This is the discussion related to the wiki page	SCP-2876. Upvoted at "General fixes and dithering about." Thanks to Cyantreuse for the sick image and Rimple, AbsentmindedNihilist, TL333s, Conwell, DrBleep and Randomini for looking this over. This is actually the first Oneiroi SCP I've written since they became a GoI so I hope I can still manage the group I came up with. Thanks for reading! Was nice to be involved in the process here, help it evolve. Turning it into an app was a clever move, and allowed you to do some really nice stuff. That splash screen is killer. Logo is pulled from this article. Skull is from Wikipedia and licensed for reuse. Screenshot is from my cell phone. All was edited in Adobe Photoshop CC 2017 and is CC-compliant. A+ job on that. I gasped out loud when I saw it. I don't know what aspect of this I like more, people buying custom dreams from Oneiroi like you would rent a movie or video game, or Oneiroi renting out their head space subscribers like some kind of dream time share. Either way, this is an enjoyable article. Enthusiastic +1. My one question: How can the subjects die in ways that leave their host body not dead? What are you referring to? The paragraph after the table talks about what happens to dead subjects, then moves on to describing what happens to injured and unharmed ones. Nevermind, I just can't read. I think the addendum really makes it interesting and steers it away from "COOL thing what makes you do BAD thing if you use it too much," which it was leaning towards without it. also the idea of paying for dreams with cognitive ability is kinda eerie…I'm a fan. Thanks to Anaxagoras for helping me smooth this one out a little more, fixing some awkward phrasing and generally making it leaner and meaner. Thanks again, man! Any references to a parallel app was indicated through patch notes included with the revision were taken out in subsequent updates. 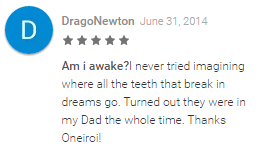 I'm sorry, but the review on the app store looks very fake. Like someone transparently made this in paint. Can you "inspect element" and rewrite the text on any review in any of the "lesser-known" app stores (ie not Apple, MS or Google)? It actually came from me going to leave a review on the Apple app store, taking a screenshot of the text box and using image editing software to remove the cursor. If other people think the fake review looks too fake I can try to make it more convincing. Yea, it kinda looks fake, but for me it doesn't matter, so do what you want to the image. Oooh, can I use that? Please, ignore me. I wanted to make a comment on the SCP, but didn't knew that "reply" was to reply to another comment rather than the page. You're good! Don't worry about it.